More Jose Mourinho sacking news now. 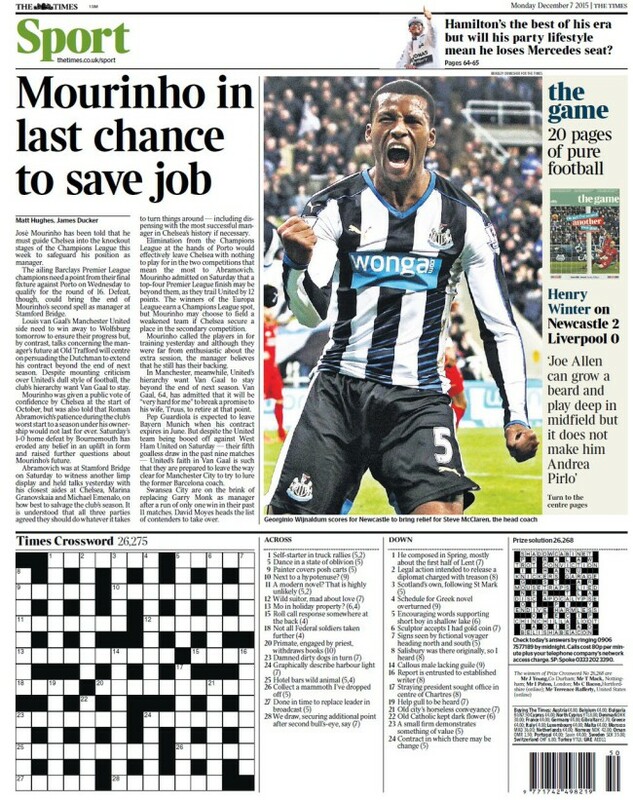 The Times leads with a story that the Chelsea boss is “in last chance” to save his job. Matt Hughes says José Mourinho has been told that “he must guide Chelsea into the knockout stages of the Champions League this week to safeguard his position as manager”. From a headline stating Mourinho has one chance, to a story beneath it that the Portuguese could be given more last chances. The Times has no idea. And neither does the Daily Mirror, which reports that Chelsea “could sack manager Jose Mourinho whether or not they beat Porto in the Champions League on Wednesday”. The Sun hedges its bets, giving Mourinho two games to save his job. It sticks a wet finger in the air and discovers that Chelsea owner Roman Abramovich “may act if the Blues lose to Porto and then against leaders Leicester in the Premier League next weekend”. Or else, he may not.